Robert Campin (c. 1375 – 26 April 1444) was a famous Flemish painter. He is also known as The Master of Flémalle. He painted altarpieces and portraits. Campin was a very successful painter. He made a lot of money and owned several houses in Tournai. For thirty years he was the most famous painter in Tournai. He had a large workshop where many painters worked for him. Campin's best known work is the Mérode Altarpiece. He painted it between 1425 and 1428. No one knows where Campin was born. By 1406 he was a master painter in Tournai. By 1419 he had a large workshop there. Many cities and churches in Flanders bought his paintings. He was married to Ysabel de Stocquain. They had no children. In 1432 he had an affair with Laurence Polette. He was taken to court for this and banished (sent away) from Tournai for one year. Margaret of Burgundy admired his work. She convinced the court to let him pay a fine instead of banishment. Campin died in Tournai in 1444. ↑ 2.0 2.1 Encyclopædia Britannica. 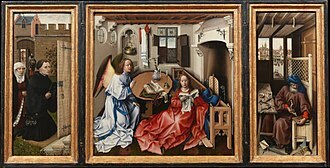 "Robert Campin"
This page was last changed on 9 October 2018, at 09:14.